Waiting for a lock to be available in the Soo, June 28, 2008. The tug Wilfred M. Cohen (C318428) was built by Newport News Shipbuilding and Drydock Company as Hull 468 at Newport News, VA. The vessel entered service in 1948 as A. T. Lowmaster (US255423) for the Chesapeake and Ohio Railway Co. It generally worked on the American East Coast. This 102 foot, 6 inch long, by 28 foot wide, by 15 foot deep tug was originally equipped with a 300 horsepower fore-and-aft compound steam engine measuring 20-44x30. It was repowered in 1976 and received a Fairbanks Morse diesel Model 10-38D 8-1/8 of 1,670 horsepower that had been salvaged from the submarine U.S.S. Finback. A. T. Lowmaster was sold to E. O. Sanchez in 1967 and then came to the Great Lakes in 1975 for Great Lakes Barge Ltd. as Wilfred M. Cohen. It moved to A. B. McLean Ltd. in 1981. Wilfred M. Cohen was towing a 300 foot, steel laden barge when the latter capsized and sank in Lake Huron off Alpena, Mich., on August 17, 1976. 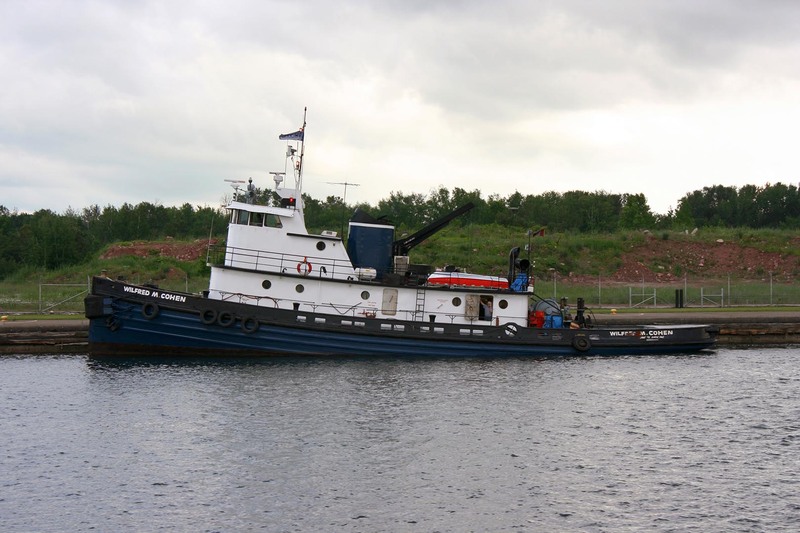 At other times the tug towed rafts of saw logs from Marathon, Ont., to Thunder Bay or pushed the barge McAllister 132 in the wood products trade. It moved to Purvis Marine Ltd. in 1994 and remains active on their account. On the St. Clair River in 1976. Pushing the barge PML 2501, May 17, 2011. Moving through the ice at Mission Pt., Jan. 27, 2014. Towing the barge PML 2501 off Belle Isle, May 19, 2015.